A Swarthmore radio program enables ordinary Iraqis to speak to the rest of the world. Hansi Lo Wang, senior producer and co-anchor of War News Radio, has been with the program since his first year at Swarthmore. ONE WINTER MORNING LAST YEAR, Hansi Lo Wang ’09 was conducting a phone interview in Lodge 6, just behind Bond Hall, when he heard something on the other end of the line that shocked him: the tattoo of gunfire, frighteningly close. “You all right? Are you OK?” Wang asked the person to whom he was speaking, a freelance Iraqi cameraman named Isam Rasheed. Rasheed, who for a moment seemed slightly shaken, quickly regained his calm, assured Hansi he was fine, and explained that a gun battle had erupted outside his Baghdad home. Then the sound of gunfire was replaced by loud wailing. “Is someone crying?” Wang asked. Jess Engebretson ’09 (left), Elizabeth Hipple ’10, and Calvin Ho ’11 work together in the WNR newsroom, preparing for summer programming. War News has broadcast almost every week since early 2005, when the project was suggested by David Gelber ’63. Recent studies make clear that this aim remains as relevant as when WNR began in early 2005. During the first 10 months of 2007, only five percent of Iraq coverage was about the daily life of its people, according to the Project for Excellence in Journalism, part of the nonprofit, nonpartisan Pew Research Center. Asked how well they covered various Iraq topics in a Project survey, journalists gave the poorest grades to coverage of the war’s impact on Iraqi citizens. But the problem isn’t just that a crucial subject has been neglected. In January 2007, 25 percent of newspaper, on-line, television and radio news was devoted to the Iraq War, according to the Project. By February 2008, that figure had plummeted to three percent—and it rose only slightly with the five-year anniversary of the war in March. Not surprisingly, the decline in Iraq coverage corresponded with a big increase in reporting on the hotly contested presidential race. The public’s growing disinterest in the war presents a challenge for WNR. So far, however, the show continues to attract thousands of listeners every week. It’s heard on more than 50 radio stations from Bologna, Italy, to Barrow, Alaska. People can also listen to WNR broadcasts over the Internet at www.warnewsradio.org or subscribe to the bi-weekly podcast. In part to achieve that goal, the WNR staff instituted a format change this semester. Rather than airing reports on a variety of issues, each show is now organized around a single theme, such as oil, local politics, the situation in Afghanistan, and the refugee crisis. During the past several years, the program has explored topics ranging from humor in Iraq to the use of Facebook among U.S. soldiers. An Iraq/Afghanistan 101 segment provides background on a key issue or figure, such as Afghan President Hamid Karzai or the history of de-Baathification. The show’s “A Day in the Life” series has featured interviews with an American soldier struggling with post-traumatic stress disorder, a doctor in Kabul, and an Iraqi blogger. “You can learn so much from talking to people (in Iraq) and finding how their lives have changed, because it speaks to the larger issues facing the country,” says Elizabeth Threlkeld ’09, a sociology/anthropology major from Edmond, Okla. Threlkeld was honored recently with the 2007 Region 1 Mark of Excellence Award from the Society of Professional Journalists. Her “Story of Two Nose Jobs” won first place in the Radio Feature category. 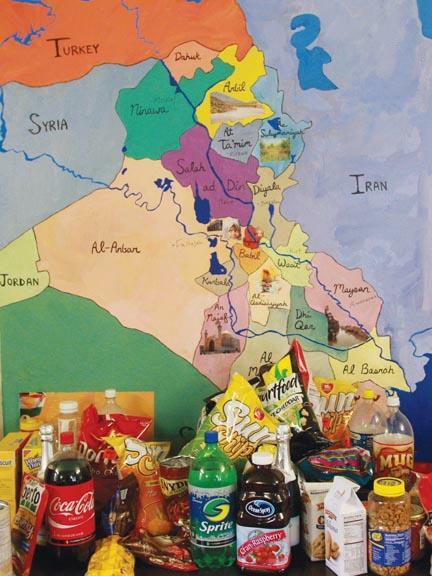 “Food Shopping in Baghdad” by Cyrus Stoller ’10 won second place in the same category. WNR had its genesis in another conflict marked by ambiguity: Vietnam. During that war, Pacifica Radio provided a nightly war summary that was “far more informative and comprehensive than anything in the mainstream media,” recalled Gelber, a 60 Minutes producer and a member of the College’s Board of Managers. But first, they had to learn how to produce a radio show. On a snowy weekend in January 2005, a dozen students worked with Gelber and three other professional journalists—including Paul Fischer, formerly of Pacifica Radio and CBS News—to create a pilot radio program. Soon students were scouring on-line blogs and directories for English-speaking Iraqis to interview. Although their interviews with sources could occur only by phone, in some ways their professional counterparts in Baghdad had little advantage: Iraq had become so dangerous that western journalists were compelled to rely on Iraqis to do most of their on-the-ground reporting. A hand-drawn map on the newsroom wall (above) competes for space with the foodstuffs needed to sustain the staff as it produces a weekly radio show about the wars in Iraq and Afghanistan. 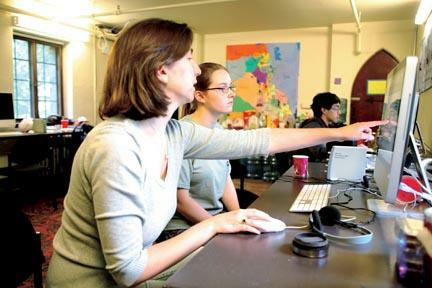 During its first semester, War News Radio operated out of a tiny conference room in Trotter Hall, then shared space with the Swarthmore College Computer Society in Clothier Memorial Hall. In June 2005, it moved to its current home in Lodge 6. Because WNR’s soundproof room had not yet been built, students working on the show that summer sometimes made recordings in people’s cars because it was quieter there. After struggling to find the right journalist to work with students, the College hired public radio veteran Marty Goldensohn, who was instrumental in making the program what it is today. During two years with WNR, Goldensohn improved the quality of student journalism and extended WNR’s reach far beyond campus. Dozens of radio stations picked up the show, which garnered wide media attention, including coverage by The New Yorker, The New York Times, The Associated Press, and National Public Radio. Goldensohn’s successor as journalist-in-residence was Ayub Nuri, an Iraqi who assisted western reporters in Baghdad before leaving in 2006 to earn a master’s degree in journalism from Columbia University. He came to WNR in September 2007 but resigned this spring to return to Iraq. A search for a new journalist-in-residence is under way. Nuri’s contacts in Iraq have been particularly useful since many of the country’s educated, English-speaking citizens have fled. Still, students still face myriad challenges as they try to report on Iraq and Afghanistan from 6,000 miles away. Because it’s nearly half a day later in both countries, students must make phone calls early in the morning or late at night. Sometimes, interviews get cut off because of poor cell phone reception in Iraq, so students have to keep calling back. On-line conversations may be interrupted by power-cuts in Iraq. And students must figure out how to stay on top of their course work while participating in an activity that can consume more than 20 hours per week. “[There’s the] time crunch of trying to balance life as a student and life as a reporter and knowing that most people just do one or the other,” Engebretson says. But the two lives also complement each other; students say their experiences at WNR enrich their academic lives and vice versa. Students have earned academic credit for participating in War News Radio by taking a class offered occasionally under the auspices of the College’s Film and Media Studies Program. Students learn the history of the war, Iraq, and the Middle East, then discuss specific events and the media’s response. Finally, they get to work on projects for WNR. Students have also received credit for directed readings on topics related to the history and politics of the region. Furthermore, WNR helps students acquire skills that they’d be unlikely to get in a traditional Swarthmore course. If it hasn’t changed their views on the war, working on WNR has encouraged students to look at the issues in more complex terms. “A lot of people think they know where they stand when they come in. Then, they ask a few questions and realize it’s more complex than they thought,” Threlkeld says. Engebretson recalls talking to someone in Karbala one morning when the line went dead. She tried calling him back repeatedly on a landline without success. Finally, she tried his cell phone. He didn’t answer. “I was sort of irritated and frustrated, and I had to go to class,” she says. Later, she received an e-mail from the man—who worked for an Iraqi NGO that focused on peace building—explaining that when she called him on his cell, he couldn’t pick up because he was in a public place. It was simply too dangerous to be heard talking to an American reporter. “When you have conversations like that, it is very jarring to go back to your privileged life as a student,” Engebretson says. 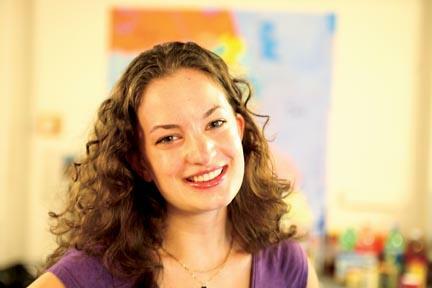 Two years ago, Amelia Templeton ’06 did a story about two brothers. One wanted to leave Iraq, the other—whom she called Jamal in her report—was determined to stay. But several months later, Jamal changed his mind and decided to leave. “That’s how I learned firsthand how difficult it was to get out of the country,” even for well-educated, well-connected Iraqis, says Templeton, a history major. After graduating, she helped Jamal’s family apply for a special immigrant visa. She eventually met the family in Jordan, where she’d traveled as a freelance reporter. Templeton—whose work included a story for public radio’s Marketplace on the lack of access to education for Iraqi refugee children—is now a researcher and lobbyist specializing in Iraqi refugee issues for Human Rights First. 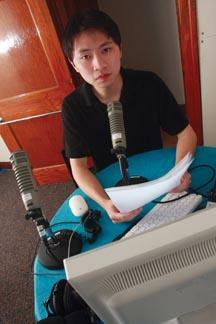 Wang, for one, hopes that WNR continues to thrive as long as it’s needed to help people understand the war. It’s helped him to connect the real world and the classroom world, to take initiative in pursuing knowledge, and to feel part of world events and a sense of responsibility within society.